On a recent episode of The Survival Podcast featuring money-saving tips, a listener wrote in suggesting that people make their own yogurt. And from the moment I heard about it, the idea was intoxicating. The basic concept is taking regular milk and adding a couple tablespoons of existing yogurt for the cultures, and then heating it up for a period of time. Over this period the happy bacteria grow and do their magic, essentially fermenting the milk and making yummy yogurt. I am a yogurt fiend, usually going through at least one or two 32oz containers every week. Given that I buy natural/organic yogurt, that can be as much as an $8-$10 week habit, so the idea that I could make it for a fraction of the cost was exceptionally appealing. I searched the internet for recipes, and most involved a lengthy period of heating at a constant 100°-110° for a few hours. Since I was rather busy and planning to be out for a week on my primitive core basic class, I decided to hold off on this adventure until my return to civilization. Meanwhile, my excitement about the idea apparently was infectious, because two of my friends also decided to take a shot at homemade yogurt. Russ used powdered milk from his food storage, and heated it in his crockpot. Apparently it’s difficult to hold a crockpot at an even 100°, and it would heat up too much, so he had to check it every so often and turn it off when it heated up too much. Nevertheless, the end product was decent – sweet and tasty, if a little thin. While on my primitive core basic class, Suchil decided to try yogurt as well. All she did was heat up some milk on the stove until it just barely came to a boil (first bubbles); she then cooled it to 100° and added the yogurt cultures, and then… put it in a pyrex bowl on the porch of the kitchen trailer to ferment outside in the 100° heat. Yes, she put a bowl of milk outside in the blazing Texas heat and it was wonderful. When I got home, I followed Suchil’s recipe since it seemed too good to be true. I made mine in quart canning jars, using my favorite yogurt (Fage) as the culture agent. I set them outside in the shade on the porch before I went to work, and when I came home… PORCHGURT. Thick and creamy and sweet, not sour or gloppy or anything. Just lovely fresh homemade yogurt. It’s amazingly easy and cheap as hell. And the only question I still have is… how is it that it took me so long to figure this out?? You need a glass bowl (Pyrex), a Mason canning jar, or a similar glass container that can handle high temperatures, and that can be sealed with a plastic or metal lid to keep the bugs and other critters out. Don’t use metal or plastic. Measure out enough milk to fill your glass container, leaving at least an inch or two at the top. You can use regular homogenized cow’s milk, organic milk, powdered milk, or other dairy milk. (I have no idea how this works with non-pasteurized, non-homogenized milk so if you’re fortunate enough to have that kind of milk at your disposal, you may need to experiment). Scald the milk by bringing it to at least 140 degrees, or until you can just barely see bubbles. The hotter you get, the more likely you’ll get a skin, so try to avoid that. Do not boil the milk! Immediately pour the hot milk back into your glass container and bring the temperature down to 100-110°. If you’re an impatient monkey, you can gently place your container in an ice water bath. 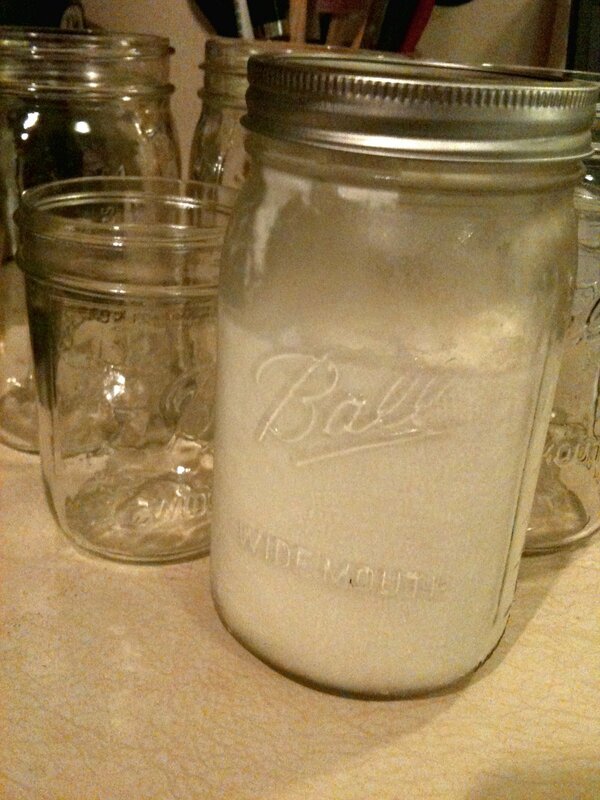 Once the milk is cooled sufficiently, add 2 tablespoons of PLAIN (not sweetened!) natural yogurt. I used FAGE, but Brown Cow, Stonyfield Farms, White Mountain, etc. should all work equally well. (In the future you’ll be able to use your own yogurt too!). I’d recommend avoiding the over-processed brands that may have sweeteners, gelatin or other addititives and may not contain active cultures. Place the lid on the jar and put it outside in the shade for 6-10 hours on a day forecast to be around 100°. Once the time is up, bring the yogurt inside and open it up. If you mix it up, it should be creamy, not clumpy; it should have a pleasant sweet smell, and upon tasting it, it should be a little sour but generally pleasant. If it doesn’t taste similar to the yogurt you used to culture it, then demons crawled into your container while you were away, and you should pour it out. If you’re not fortunate to have super hot summer days, you can try the crockpot recipe here or look for others online. I have not experimented with them yet but would love to hear from those who have done so.